In many of ways we’ve already been on loads of microadventures as a family. 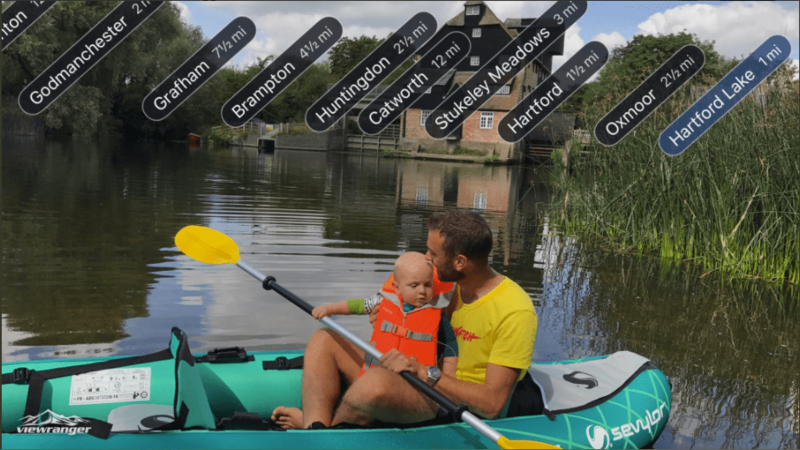 We walk a lot, cycle a lot, plus we’ve been on river boat trips, swum in the sea, and generally done plenty of cool stuff together in plenty of cool places since Sonny was born. But this was probably the first family trip that felt properly adventurous. I’ve owned an inflatable kayak canoe for the past 10 years but it’s safe to say it’s seen better days (currently recovering from its second puncture in my garden shed), so it didn’t feel like the sturdiest vessel to be introducing my 15-month-old son to the water in. I’ve been trying to convince Gemma (Sonny’s mum) for ages that we should launch the little dude before the end of the summer, so there was only one thing for it – I needed some new gear. I’ve been quite enviously watching people paddle past me with various incarnations of Sevylor canoes over the past decade, and the Madison is one I’ve had my eye on for a while. It sits nice and low in the water, making it easy to manoeuvre with kayak paddles, and looks incredibly comfortable and sturdy. So that’s what we got – and it’s already proved a great decision. The Madison comes in something resembling a large sports bag so is easy to transport, takes less than 5 minutes to pump up, comes with two paddles and its own foot pump, and has a really robust feel to it. 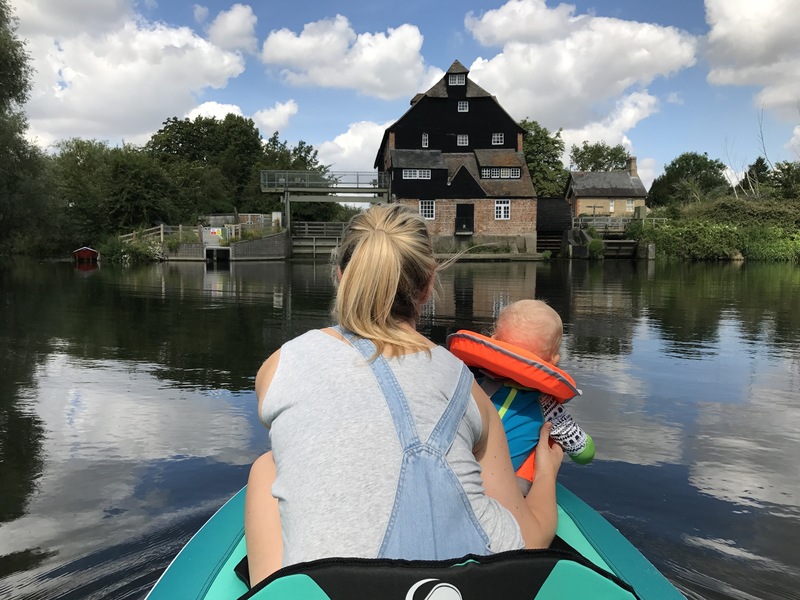 Less than 10 minutes after parking at the National Trust’s Houghton Mill, the three of us were ready for our first proper family microadventure. We were both a bit nervy getting Sonny into the boat, but we had nothing to worry about. 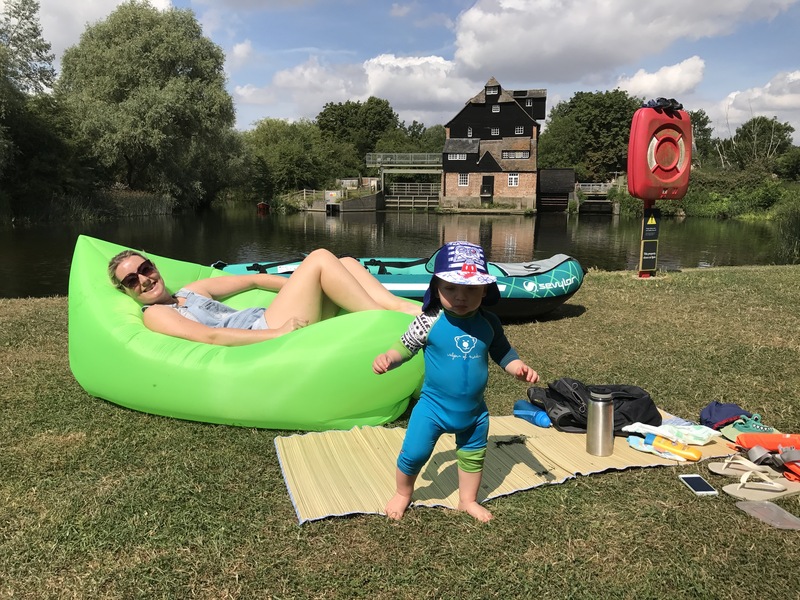 The Sevylor Madison felt very sturdy and stable in the water and the comfy inflatable seat cushions meant mum and toddler were both safe and happy in the front while I thrashed about with the paddle behind them pretending I knew what I was doing. The little champ was fully kitted out for the occasion in his sun suit and baby life jacket (just £13.99 from Decathlon!) and Cambridgeshire’s River Great Ouse is hardly the Amazon, so once we got moving we knew we had nothing to worry about. The river is shallow and lock controlled with very little current, leaving us free to drift along in the sunshine pointing at ducks, moorhens and swans and watching little schools of fish dart through the reeds beneath the boat. Why can’t every day be like this? Toddler attention spans being what they are, Sonny had had enough after about 10 minutes so we turned the boat around and paddled back to Houghton Mill. The day didn’t end there though, because we’d planned ahead and brought a picnic that we munched on while Sonny used the canoe as his own private bouncy castle for the next couple of hours. I took him out for another quick paddle (hardly even got away from the river bank before he kicked off), took him for a quick swim in the river (he loved this! ), then we lounged around eating cake until it was time to take Sonny home for his afternoon nap. Gemma laughs at me when I say cheesy stuff like this, but it was honestly one of the happiest and most enjoyable mornings of my life. I took a last minute day off work because of the awesome weather forecast, got the canoe delivered the previous morning, and spent a few wonderful hours with my two favourite people doing things that all three of us absolutely love. We took a load of photos and I’ve written this daft blog about our first family microadventure, but it’s the memories that will stick with me forever. Until I read this, I had no idea you could get inflatable kayak’s! Great photo’s, it looks like you had a wonderful family day out!